For over 50 years Holiday River Expeditions has gone with the flow and away from motors. The rush of wind, a chatty raven or a churning rapid will accompany you absent the drone and smell of a motorized raft. Float along with the currents, become literate in these landscapes from your expert guides, leave the heartbeat of a river in your memories. This is one of many distinct traits that distinguishes Holiday. Whether it’s our top-notch gear, our unparallelled service, or our deep commitment to wilderness, we offer the best backcountry has to offer. You’ll be well taken care of. Our guides are the best in the business; all are trained in river and backcountry safety and first-aid. They’re all exciting individuals, experts in everything from rowing a rapid to sharing a good story. They take having fun seriously and will inform, entertain and engage you in a variety of ways. They’ll also show you their favorite places… a short walk up a side canyon to a private waterfall… a view from a cliff overlooking what seems to be the entire world… sleeping under the stars on a soft, sandy beach. Holiday River Expeditions offers you worry-free conveyance into otherwise unapproachable wilderness. Whether on a raft or mountain bike you will enjoy the best gear in the industry. As you watch the other companies pass by you’ll be pleased you picked the most organized outfitter who who keeps all equipment in tip-top shape. In camp the efficiency and organization continues. From the kitchen to the common area complete with a hand picked Library, chairs and a table for drinks, water and appetizers. A well thought out garbage sorting system, a portable toilet set up in a private area and hand washing station round out the camp. All the details are covered. Since 1966, Sue Holladay brings years of river running and cooking experience to our menus that accommodate everyone’s tastes and dietary needs. Just show up for the meals and enjoy your day of adventure. All the planning, packing, shopping and preparation is done for you. 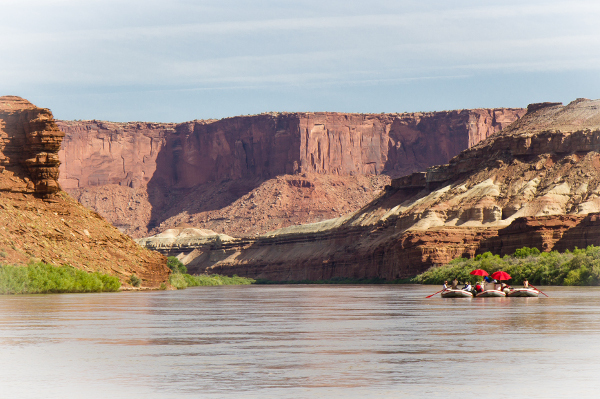 Our guides create river recipes into “to die for” meals. 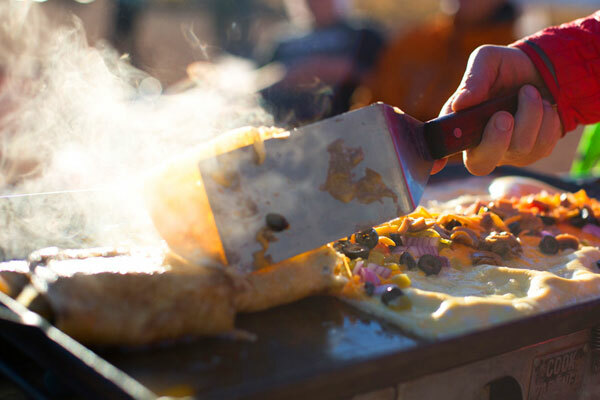 Dutch-oven lasagna, salads, fresh salmon or steak, brownies… You will be hungry! Oh yeah, and we do the dishes! It’s old fashioned to receive personalized service but when booking your Holiday River Expeditions trip, that’s what you can expect. Whether you contact us, by phone or Email, Karen, Lauren, Natalie & Jesse are in our office ready to help you. With collectively over 50 years experience they know what they’re talking about and will take the time to share their trip and area knowledge with you. They get out of the office often to enjoy our trips or find new outdoor adventures. It’s this perspective that allows them to listen to you and help you find the right trip for your needs. When it’s all said and done, our experience outside the office is most valuable when we share it with you! The first time Dee Holladay’s friend took him down the river, a lifelong passion began. 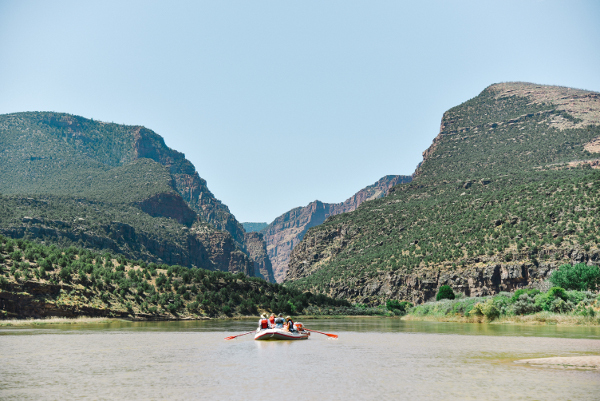 After one-trip, Dee began running Utah’s rivers on a regular basis, delving into magnificent landscapes, grand canyons, and lively waters. 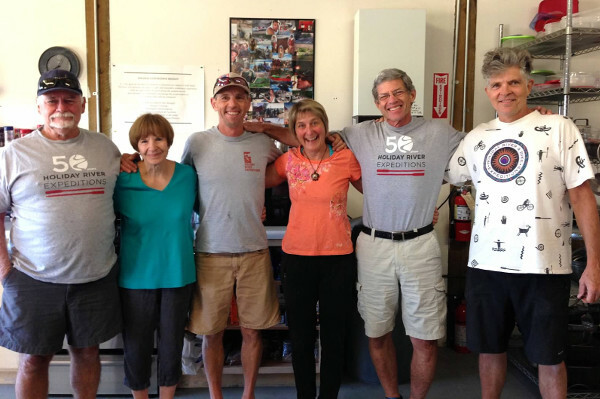 In 1966, Dee and his wife, Sue, decided to become river outfitters. 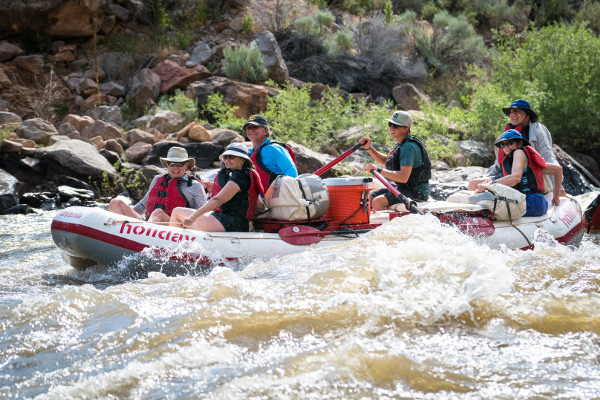 At first it was Holladay Expeditions, but the celebration of being on the river (not to mention the confusion in name spelling) inspired the new name of Holiday River Expeditions. 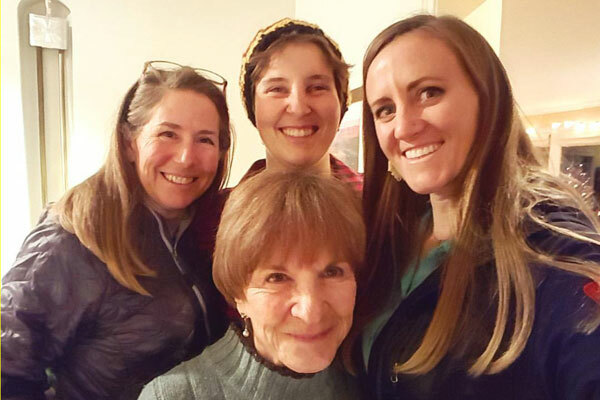 In the years that followed, Dee and Sue spent more than 100 days on the river each year sharing their hospitality and wilderness insight with Holiday guests. 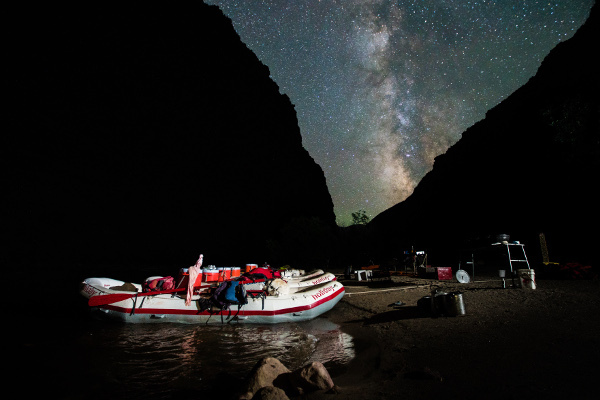 Holiday River Expeditions was founded on the hope of a rueful dreamer, Dee Holladay, who saw the rivers we run not simply as a recourse to build a business around but a gateway allowing us to tap into something deeper than ourselves. That solid grounding has given Holiday an active land-ethic that has helped guide our mission, our policies, our advocacy and our everyday practices ever since. We are lucky enough to navigate these rivers many consider not merely beautiful but sacred, and so we respect them as such. Like a river’s pulsing current, Holiday will persistently move to ensure we have rapids to run for generations to come. We’re proud of our accomplishments as a company and the individual accomplishments of our team. 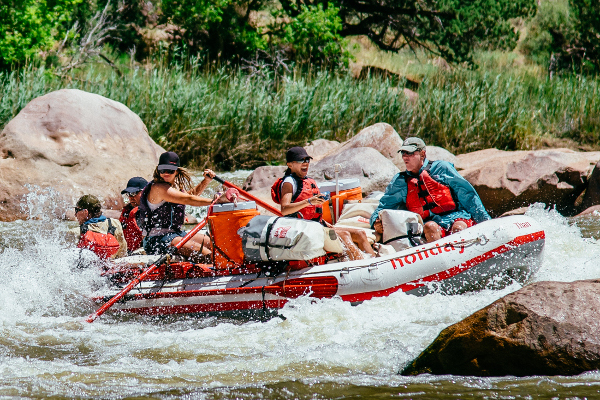 The Ultimate Adventure Source book independently ranked Holiday River Expeditions as a five-star outfitter — there were only two rafting outfitters in their worldwide listing that achieved five-star status.